So in anticipation of the Interpol tonight at University of Miami's Convocation Cente-- I mean Bank United Center, here are a couple of short video clips we took when Interpol hit the stage V Fest in Toronto. They looked bored as always. Played a solid set (...minus the one false start they had. 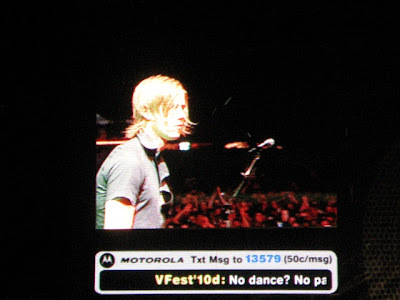 Paul Banks looked a little embarrassed in the monitors. The drummer frustratingly tapping out the beat their second time around.) but for some reason it just did not feel loud enough. We were noticeably further back than we were for Bjork but I have seen them in festivals (and clubs) before and they definitely feel more comfortable in the dark and smoky confines of a club (nothing beats their show at Ice Palace a few years back in Miami - 2003 - Wow). So in honor of their performance tonight, I give you a remix of their current single Mammoth and an orchestral version of the fantastic album opener Pioneer to the Falls. I am not sure how I feel about Mammoth yet. It is definitely a change for them, Banks vocals do not even sound like him. The rework by Erol Alkin smartly stays away from the current electro movement and just beefs up the drums and high hats and makes the song a bit more dance floor friendly. 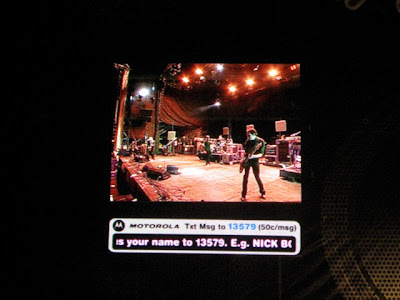 Aaannd here are the videos of Interpol peforming Obstacle 1. You can obviously get better quality videos from other users of YouTube.